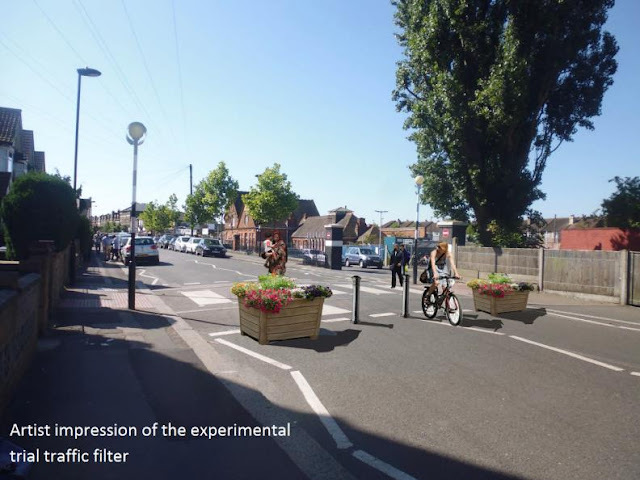 A consultation has been launched on two further proposals to make Estreham Road near Streatham Common station safer for cycling as part of the Transport for London Quietways programme..
Estreham Road forms part of Quietway 5 which will run from Waterloo to Croydon. Quietways aim to provide direct routes for cyclists along traffic calmed and quieter roads. Although primarily a residential road Estreham Road suffers from a large volume of through traffic, much of it seeking to avoid Streatham High Road and Greyhound Lane. Lambeth wants to remove this 'rat-running' traffic to make the road safer and more welcoming for cyclists. Sustrans, working on behalf of Lambeth, launched a consultation on making the road more cycle friendly last year but following feedback from local residents and others a rethink has been carried out and now three options have been developed. They are now carrying out a consultation on the three options. To find out more and respond to the consultation see: online survey: Estreham Road - Additional Designs The closing date for the consultation is 11 January 2016. This work is part of creating the Quietway cycle route from Waterloo to Croydon. Estreham Road will be part of this new route. Estreham is part of an existing cycle route though suffers from a high level of non-residential cut-through traffic (an average of 3,118 vehicles per day). The reduction in motor traffic is expected to make the area more pleasant to live in and support more people to walk, cycle or play. Quietways provide an opportunity for communities to benefit from Transport for London (TfL) investment that can make local streets more attractive for everyone. Quietways are direct and easy to follow cycle routes in London on quiet roads, parks and waterways. They’ll make it easier for many local people who would like to try cycling, but would rather not cycle on main roads. Estreham road is a residential street and already part of an existing cycle route. Although it is not a perfect cycle route at the moment it is far more suitable for cycling than many of the surrounding streets. The proposed route alignment for the Quietway has been decided with feasibility studies from Transport for London and the borough. Q) What studies have been carried out? Traffic counts, origin and destination surveys and retail surveys. The parking study will take place with a borough wide review. All study results will be visible online together with the design information. Q) How can a reduction in motor traffic improve the area? Neighbourhoods are more likely to have better community links if there are low traffic levels. There are also examples to show that reducing through motor traffic reduces crime and makes neighbourhoods more attractive to live in and pass through. Q) Will I still be able to drive to my home / place of interest during a proposed trial? Yes, you would still be able to access everywhere on Estreham road by car with all three options, although you may have to take a slightly different route. Please see each option to understand how car routes may change slightly due to access restrictions. Q) Why have a temporary trial? The temporary trial would give us an opportunity to understand the impact of the changes in the real world that no traffic modelling could tell us. In some cases these changes reduce overall traffic levels. We would carefully review all the data from the trial after six months in order to make a decision about the next steps. We need at least this much time to allow for changes to traffic and behaviour to take place. It would need to go through a formal consultation process for the filter to ever to be made permanent. Q) Will changes to Estreham Rd mean heavier motor traffic on surrounding roads? People tend to use Estreham Road as a cut through to avoid using Greyhound Lane and Streatham High Road. Some of the traffic would stick to those A roads which are designed for heavier traffic. We would monitor traffic levels on the surrounding network to measure the impact during the six month trial. In other examples we see a permanent reduction in traffic as behaviour changes. This reduction in traffic is usually due to people either combining journeys or changing modes of transport all together. Q) What is the consultation process? We are communicating the details to local residents via posted letters, on street posters, drop in sessions and mailing list email updates. Residents and non-residents are encouraged to fill out a pre-consultation survey, this is so we can fairly assess points of view on the three designs. Only then will a design go forward to formal consultation.